Our variety of tomato plants are providing plump, red, goodness everyday now. I have sold many pounds at the farmstand, as well as served fresh tomatoes daily to our family. 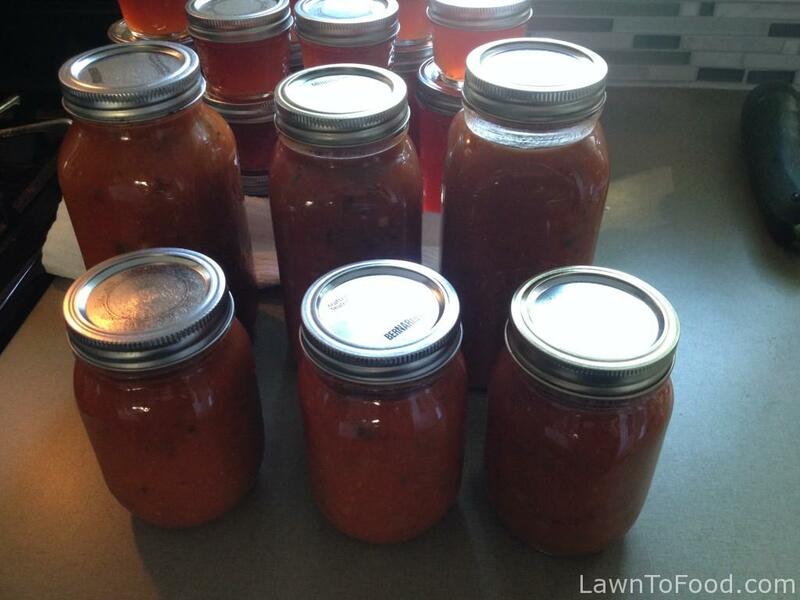 With the abundance of ripe ones, it’s time to start preserving tomatoes for the fall/winter/spring months. To start, I spent some time thinking about where I use cooked tomatoes in our daily meals. Is it pasta sauces? salsa? ketchup? mexican? tomato soup? How much do I need to preserve, to get us through the year? Where is my time and effort best exerted to produce these products? When would I be better off purchasing tomato based items? These are all important questions to consider for your unique circumstances. Italian flavored sauce is one of our most used tomato items. I estimate that we use an italian pasta sauce about once every 2 weeks. That means 20-25 jars of pasta sauce would get us through 52 weeks of the year. Since our household is down to 2 people, I can process a majority of pints, rather than family sized quarts, of italian sauce to cover our needs. 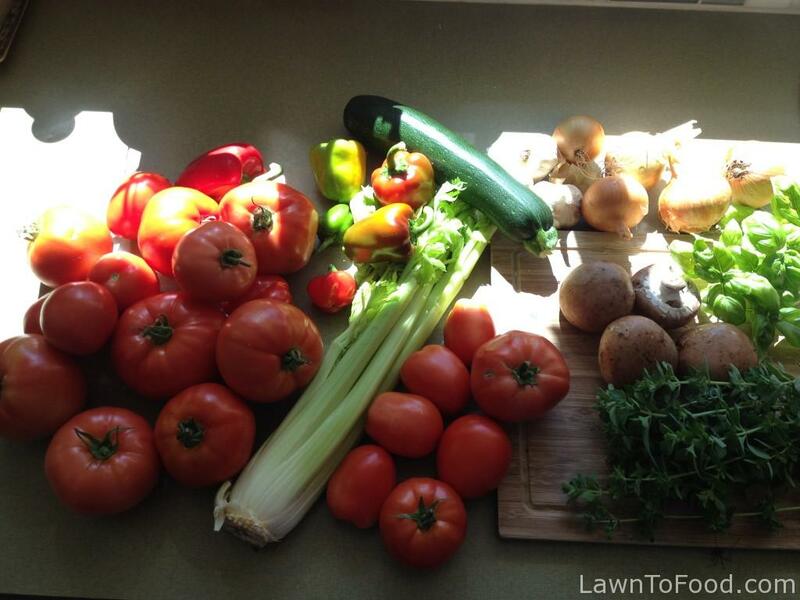 Yesterday, I scoured the garden, and the fridge, for items to put in my italian tomato sauce batch. I gathered all kinds of tomatoes that were ripe. Beefsteak, plum, yellow and cherry tomatoes were all destined to hit the pot. Then I picked peppers that were ripe and ready. Also a zucchini, a carrot, along with some oregano and basil. From our pantry, I found a few heads of garlic and our garden onions. Lastly, from the fridge, I added store-bought celery and mushrooms. I chopped all of the vegetables into small chunks and sautéed them in a large pot. I used 1/2c. olive oil in the pot to help the sauteing process. To save some time, you could run the onions, garlic, celery, mushrooms, carrot, zucchini and peppers through a food processor grater. Once the vegetables were sautéed nicely in the oil, I added about 1c of flour to the mixture. The flour and oil blended together to start forming a roux, which will thicken the sauce. I love using a roux in my tomato sauces because it adds a bit of a creamy texture and eliminates the need to simmer it for hours until the sauce reduces and thickens. 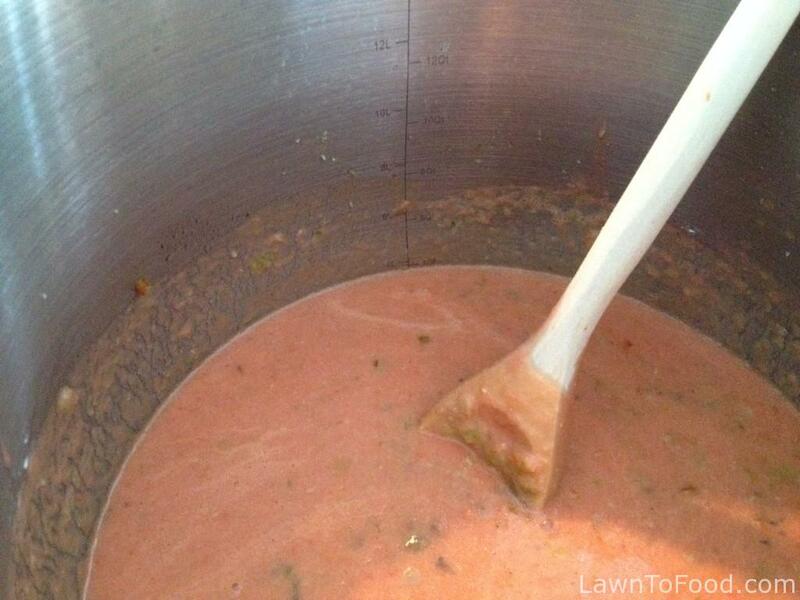 Stir the tomato puree into the vegetable roux. 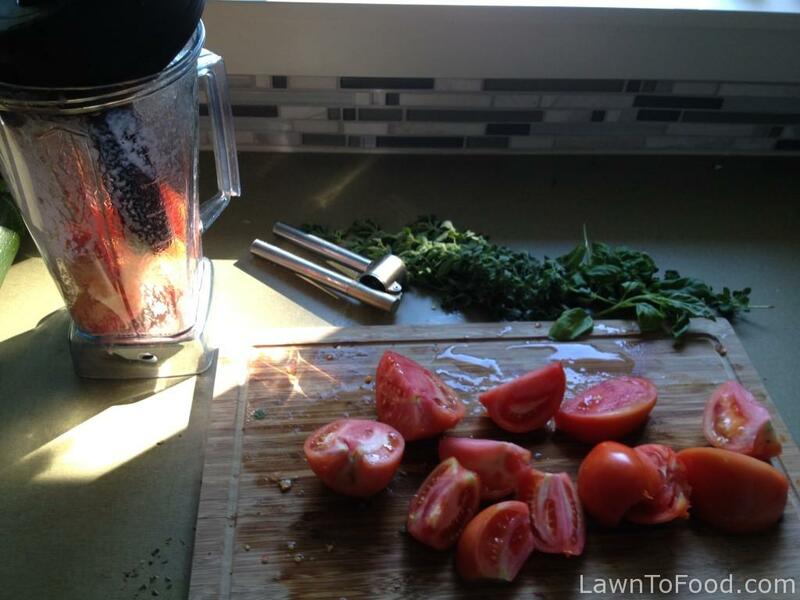 The liquified tomatoes, when blended with the vegetables, will form a silky smooth sauce. At this point I start adding seasonings. For this 6 quart batch, I added 2 heaping TB of paprika (to create a rich, red color), 2 TB vinegar, 2 TB of sugar, 1 TB of sea salt. Taste your sauce and adjust seasonings accordingly. I also added a 1 tsp. of cayenne, and 1 tsp. of black pepper to this batch along with the fresh, chopped oregano and basil. I brought the sauce to a soft boil for 5 minutes and then tasted it for final seasoning. After taking a couple of scoops out for dinner, I poured the rest of the sauce into hot sterilized jars for processing. I processed the jars using my pressure cooker at the recommended manufacture’s directions, which was 10lbs pressure for 10 minutes. Bingo! Processed sauce in less than 2 hours. Boun Appetito !! My next tomato sauce batch will have a Mexican flare using chilli, chipolte, cilantro, cumin & lime zest. 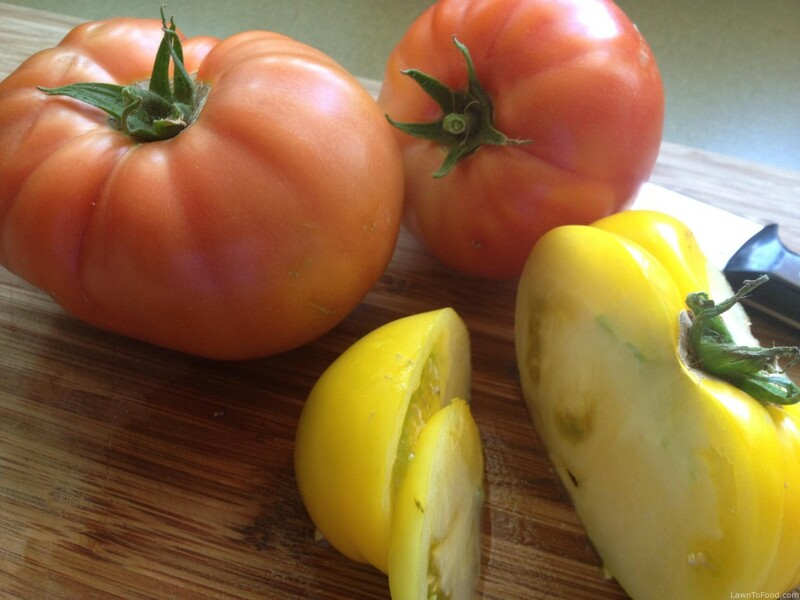 This entry was posted in Fresh Vegetable Ideas, Let's Eat, Preserving & Using Preserves and tagged tomatoes by Lynda. Bookmark the permalink.